Saturday's egg count was 15 eggs and at least these five babies. That's only the "in process" birds! A cycle of eggs and fledging has all ready occurred this year. And yes, bluebirds like the number "5" for family size. I'm waiting on the final rise for two loaves of bread made with a sponge starter as described in the New Joy of Cooking. (Not the new New Joy, just the old New Joy.) The bread rose the first time in the fridge overnight because I started the starter yesterday afternoon. The type of starter and a slow rise usually result in a very tasty bread. We'll see tonight if that's still so. Wow, on the feeder there are several goldfinches that look almost olive today along with a few of the muted winter yellow. I've been grazing the Internet regarding growing hair long or longer. One interesting hair-related item I found was that for some people, use of shampoos containing sulfates can result in an itchy scalp. I believe it relates to the sebum on the scalp and clogging of pores but then again I may have that a bit off. Anyway.....I found that I am one of those people. I switched to a sulfate-free shampoo and conditioner and my scalp is so much happier. No wonder the dandruff shampoo was not working. There has been knitting. This is an "old" photo; I've actually knit a few more inches on this sock but I'm too lazy to document it right now. Maybe when I show you the bread, I'll give you a new view of the sock. This is a restart of socks using yarn I won from Joan many moons ago. I'm using magic loop on a US 1 addi turbo. It is a nice thinner fabric. There's also been spinning. I met with the/my local spinning group again this past Monday. It was really nice. I've been having dinner with my husband every night this week. Work night dinners with my husband. Nice. I had a pretty good week overall, despite completely forgetting about the humidity levels in DC and having the worse "hair" week of the last decade. This was my first week of a year-long detail in DC and I'm having the opportunity of experiencing what it is like to have my own office....with a door. No exterior window, so don't get too excited for me. Normally, for work I get to sit at a folding or conference room table in chairs ranging from folding chairs to kitchen chairs to pretty decent office chairs, so a "real" office is a treat. My hotel is about 12 blocks from the office so I did get a lot of walking in....and also more showers. I'm going to have to strategize (is *so* a word!) my day so I don't feel like a wrung-out rag when I arrive for work in the morning. I am such a walking wimp since I really hate being sweaty in work clothes. *whine* On the other hand, I am happy with the exercise I got this week. I've found there is a work-out room in the building so I may be able to include it in my campaign quest to be more fit. Besides trimming, laundry, and errands, I also cooked! Really. I was browsing in the cookbook bookcase and came across Jane Butel's book and decided pork and green chile enchiladas, New Mexico style sounded great. The recipe was inspired by Jane but isn't in the book, exactly. Best laid plans....often get side-tracked. A nice post about my visit to San Francisco will be arriving in this space this week. Later this week. Between the laundry monster, catching up on sleep, administering worm medicine (to cats), packing for working in Milwaukee, and a sassy Wii Fit, I lost the ability to compose a good SF post today tonight. Yes, the Wii Fit asked me if I stumbled a lot, too, Stacey. Sassy. However, it redeemed itself by being fun. Too bad it doesn't travel easily. If you look closely, there is last week's bluebird on the corner of the roof. The trees are showing a bit more green today than last week. Have a great Monday! Whew! Those three days of work this week seemed long when I was looking forward to today and the next couple of days. First I'm going to run around the house picking up the stuff I didn't pick up last night, pack clothes and crafts, and dose the cats with hairball medicine. Yes, here at Chez Purling Oaks, what is usually called Spring by most folks is called hairball season. One of these years, I'm going to save the combings and spin myself enough yarn for a blanket. Each time I comb Blue there's enough fur for new kitten. Really. Well, not that we need another cat around here. Then, I'm off to get a massage and see if Gabrielle can convince my back muscles to relax. I feel as if my left shoulder is up to my ear. After whatever miracles that can happen on the massage table happen, I'm off to Chicago to meet my blogless friend, Charlynn, for the Quilt Festival. Whoop! The weather should be very nice for driving and we're planning on finding a deep dish pizza one night, for sure. There will be plenty of shopping opportunities and it is always inspiring to view the quilts and other creations presented at the Festival. Random photo from my walk in the woods last week. I better go start my to-do list! Happy Thursday! This photo was taken a little after 9 AM this morning. 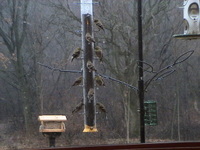 I love how the finch feeder is full of birds and, if you look closely, you can see a squirrel tail on the far feeder. It started raining early this morning but, as you can see, the snow has started. Mom's flight from California made it into Detroit just fine this morning but her flight to Appleton was canceled. Now, she is on a flight to Minneapolis with hopes of arriving home on a third flight this afternoon. Good travel thoughts for Mom are much appreciated. Yesterday, I rented the wallpaper steamer machine from our local hardware store at noon. DH brought it back at 4:30 PM after we removed the wallpaper from our basement bathroom. I was afraid this would be a beast of a job but only a normal amount of effort was expended. One hint for those of you applying wallpaper....remember to prime the surface first, even if it is only a patch. If you don't prime, the wallpaper will stick, stick, stick when you want it to release should you or someone else ever want to remove the paper. DH has all ready removed the vanity and replaced the toilet from the old blue (yes, 1970's blue) ceramic. Now, to research what flooring to install. Vinyl or Ceramic (on concrete) or some other option? It is raining today and the air smells clean and woodsy. I stood on our front porch and drew in several big breaths, filling my lungs with the goodness. I love this smell of the pines and earth and rain. The rain is renewing--cleansing the air and engaging my spirit. I wish I was more of a wordsmith so I could give you the same feeling. Living in the country has challenges and rewards. Today is a reward. Here is the view from my seat at the dining room table this morning. 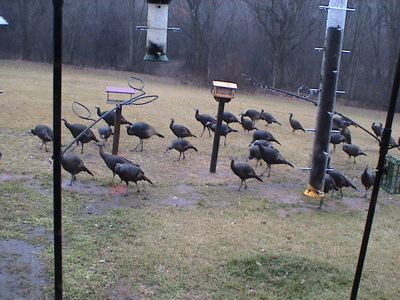 I bought the long thistle feeder this October with our Jung dollars, kind of as a joke. 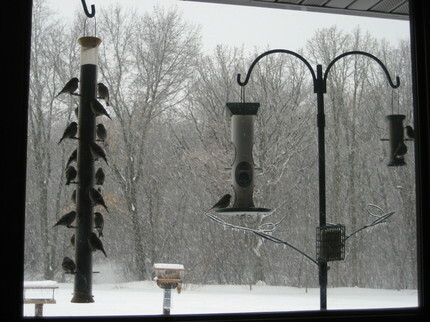 It has turned out to be very entertaining and we've seen birds covering the feeder just after filling it. 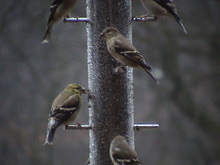 These are gold finches with their drab winter garb. In Spring, we will see more sunny yellow feathers. We tried to count the turkeys and agreed that there are over 40 birds, but we couldn't settle on a grand total because they were in constant motion. I heard the turkeys this morning from the front porch and spied them through the trees in the field to my west. They must have made their way into the woods and then out into the yard. We have a quiet New Year's Eve celebration planned for tonight. Dinner will be venison tenderloins, probably pan-fried with a little garlic, little red potatoes, and something green (I'm still deciding) with a bottle of cabernet sauvignon that was a holiday gift from friends who know wine, so it should be very nice. Oh, yes, and we will be watching the Packer game and crossing our fingers for a good result. I enjoy the games but this wild card game selection is for the birds. :-) Have a safe and happy New Year celebration!